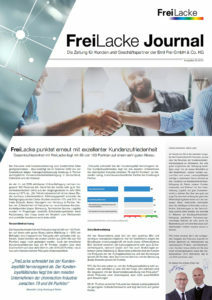 The FreiLacke Journal is the company’s customer magazine and is published twice annually. In addition to information about FreiLacke, it also contains other interesting information on coating industry trends and projects. Please register to receive the FreiLacke Journal by mail in April and October. Yes, I would like a free subscription to the FreiLacke Journal.